Helsinki in early April is chilly and blustery. 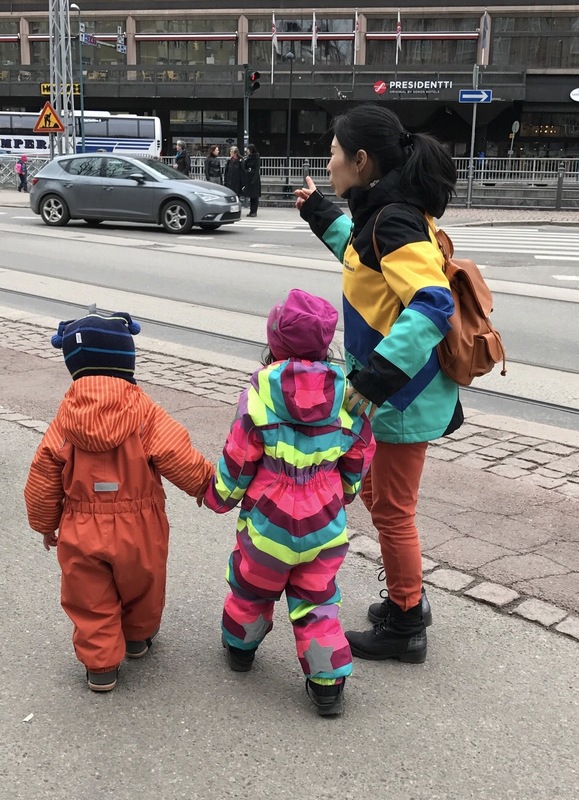 All the children are bundled up in one-piece snow suits. I was wishing I had one! Finland is not a place for religious pageantry and parades as in Southern Europe. 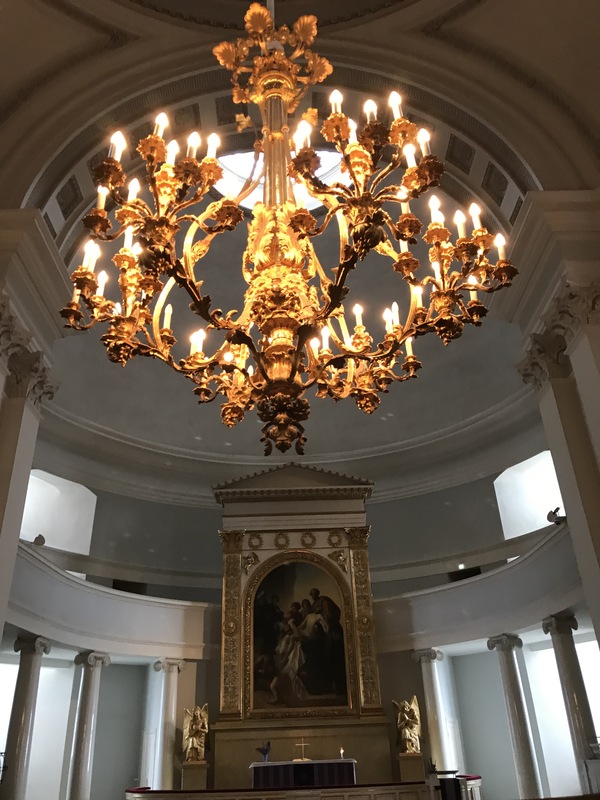 The Lutheran Helsinki Cathedral is impressive in its grand spaces, but very austere. Aside from Martin Luther gazing skyward, there’s not much to look at. And (at least on an admittedly quick stop) I didn’t see a children’s corner with little chairs, or posters about bake sales, or ladies dusting things, or a single clergy person. 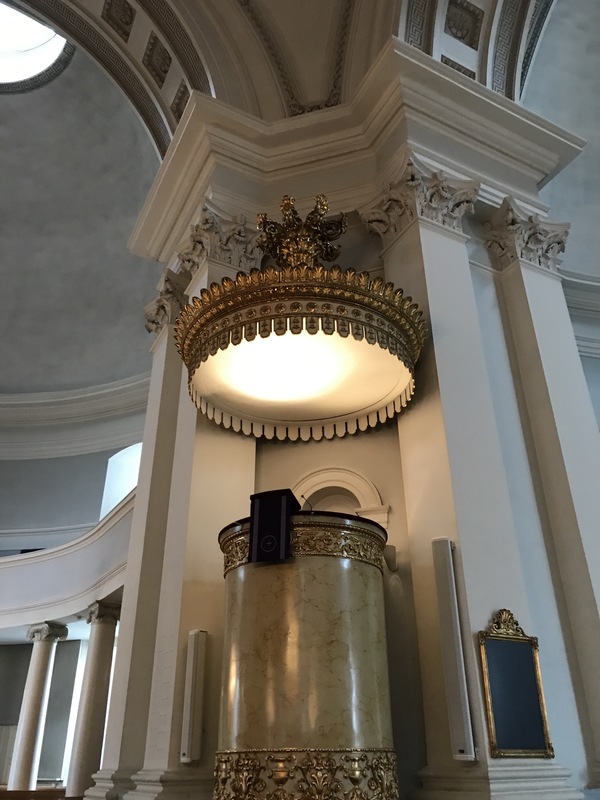 The National Museum of Finland was a much more church-like experience. 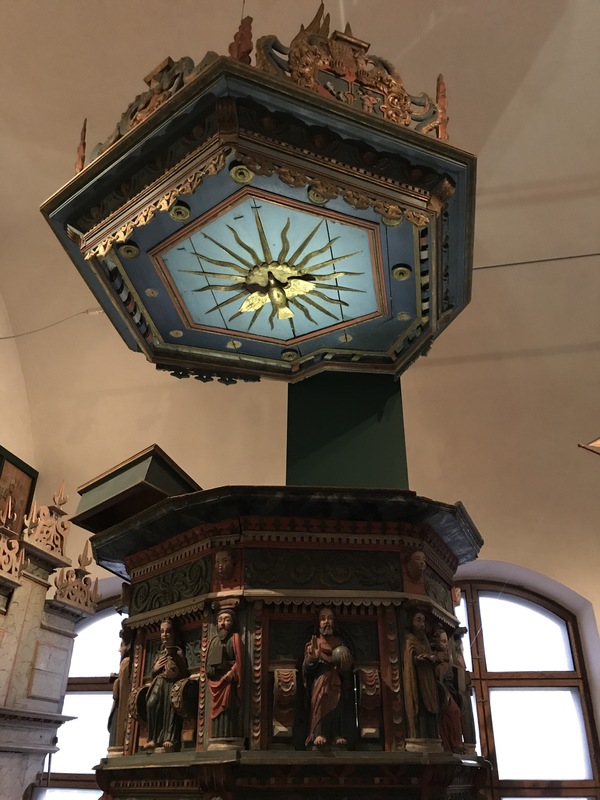 This pulpit is from the church in Parainen, Finland, dated 1650. At the time, Finland was a frontier to the west of Sweden–and very handy as a buffer between Sweden and Russia. Newly built churches were required to have pulpits. Lutheranism was the state religion of Sweden, and everybody was expected to sit still for it or else. 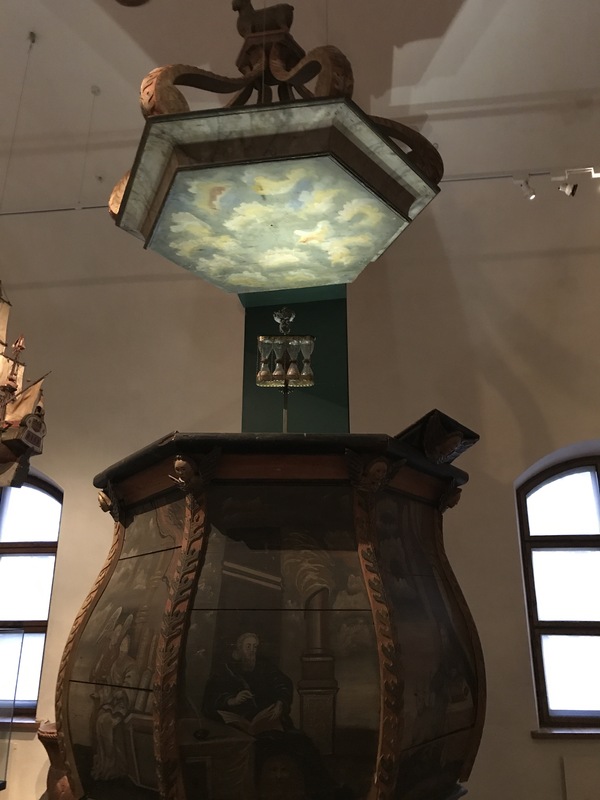 This pulpit is from the Kalvia Church, around 1726. I like the cloudy heavens painted on its ceiling just above the preacher’s head. 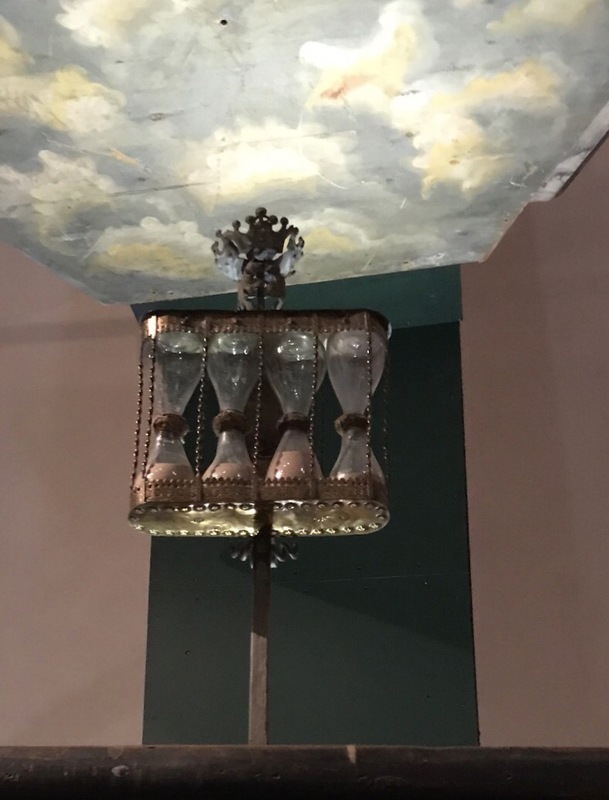 Wait, there are hourglasses? Four of them? How long is this sermon going to be, anyway? Better not ask. 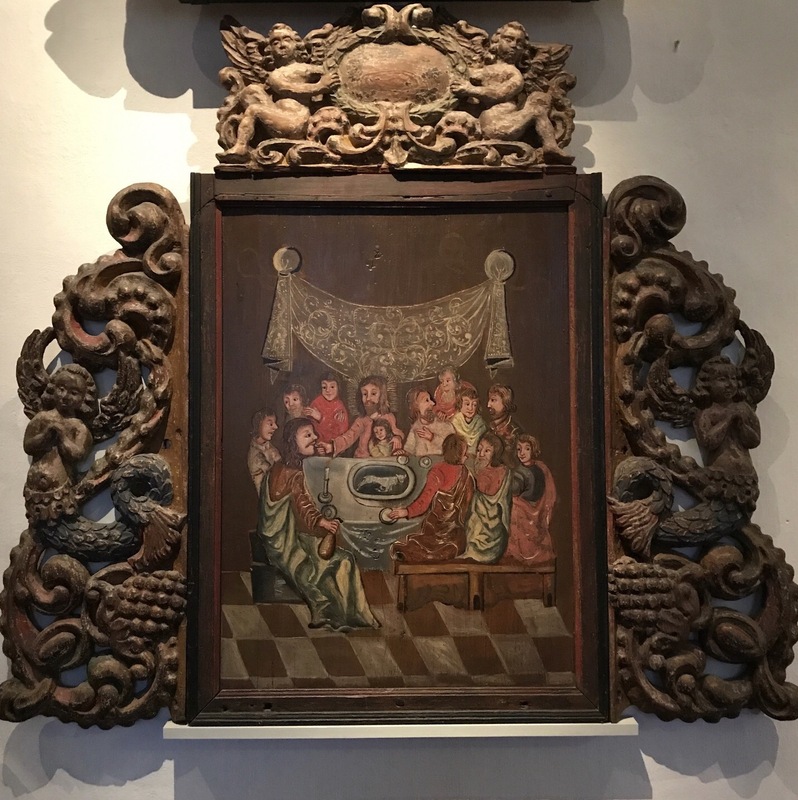 My favorite item was an altarpiece depicting the Last Supper. It’s from the Ylane Church, dated around 1675. 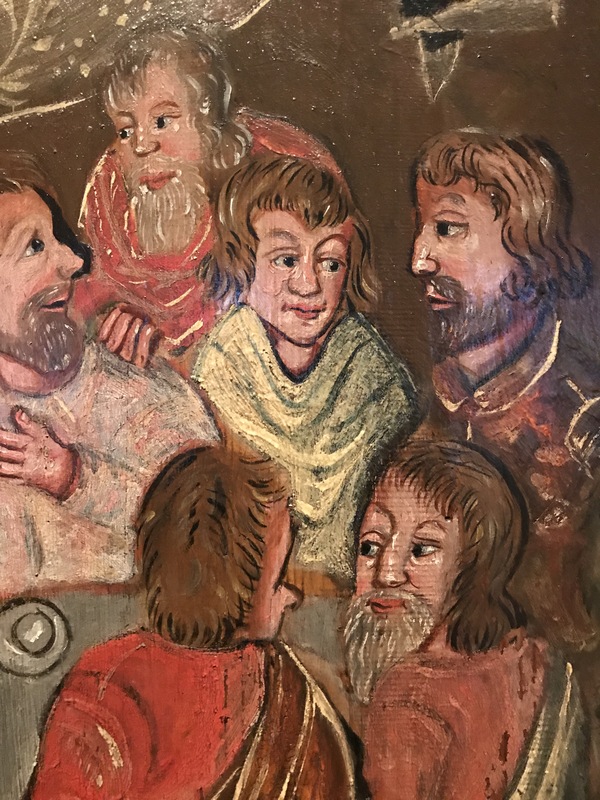 The faces are friendly and everyone is having a nice time together. There seem to be only 11 apostles. Apparently Judas has already left the building. The museum also had wonderful religious wood carvings dating back as far as the 1200s. I liked St. Martin on his horse, about to share his warm cloak with a beggar. 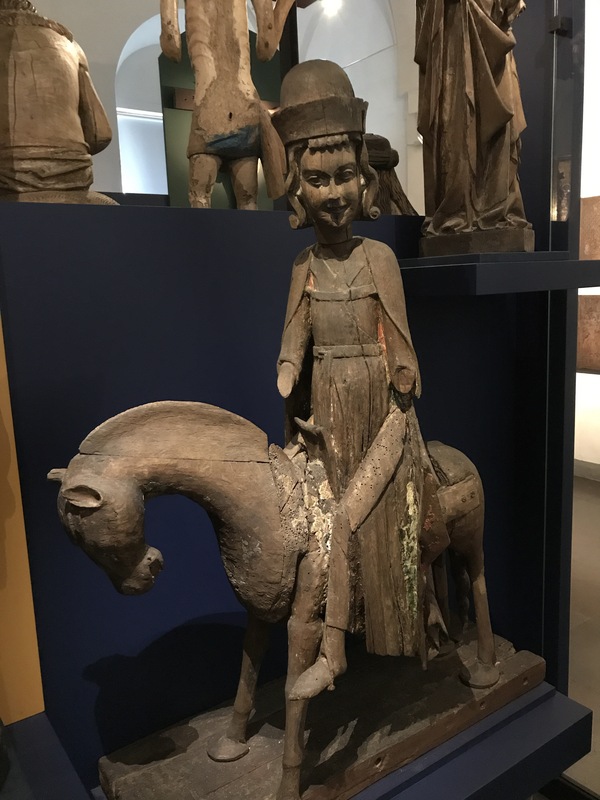 He was carved and assembled from several pieces of wood around 1320. 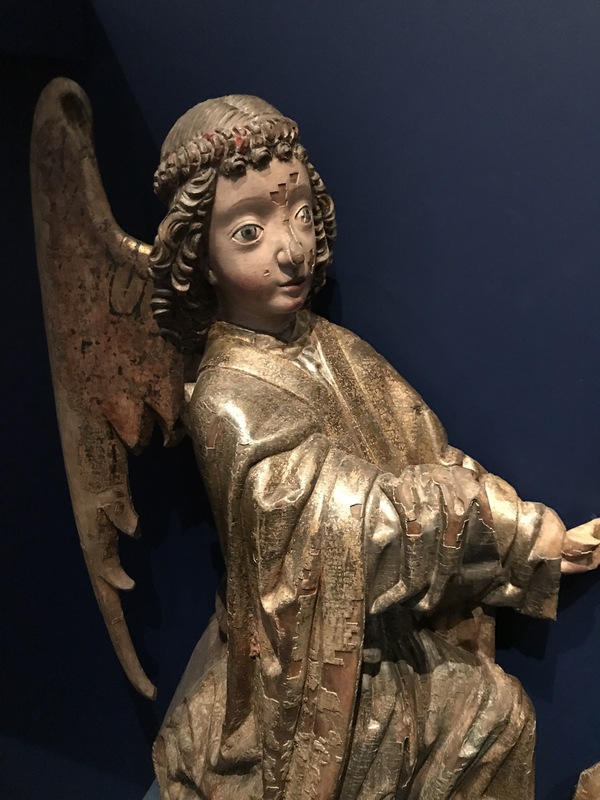 I gazed for awhile at the Archangel Gabriel, carved and gilded around 1500. 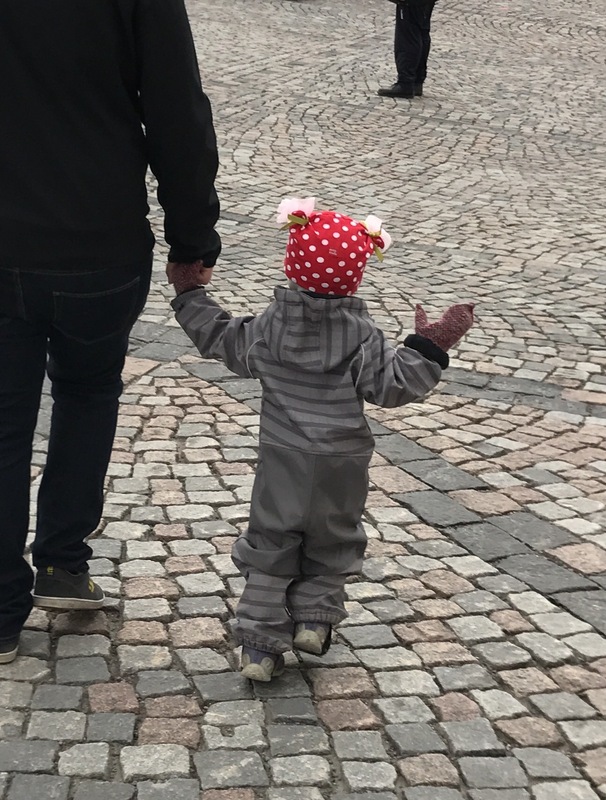 Then I was back on the friendly but chilly streets of Helsinki, wishing I had a striped snowsuit and a red polka-dotted hat with flower ears. This entry was posted in Art, Cathedrals and Churches, Explore Europe, History, Why I Love Finland and tagged Finland, Helsinki, Helsinki churches, Helsinki museums, religious art in Finland on April 12, 2017 by Claudia Suzan Carley. 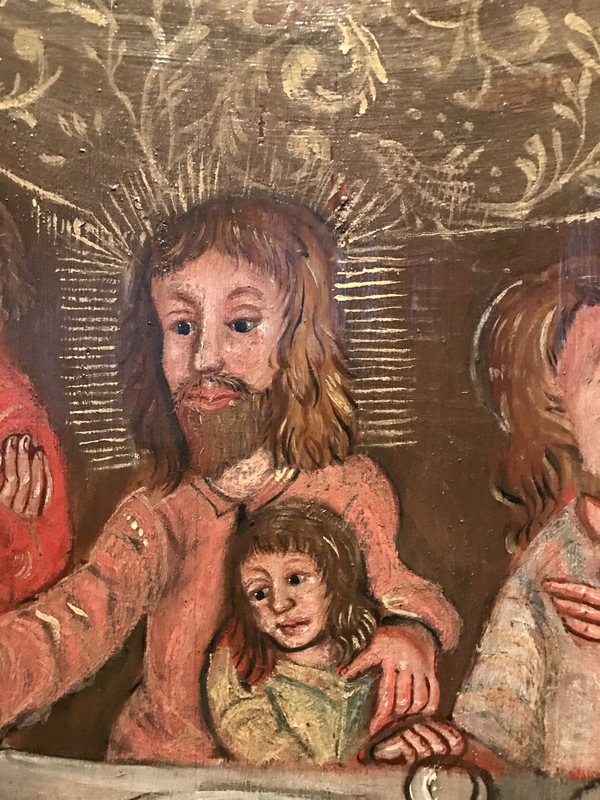 That lamb their eating in the last supper looks like he isn’t prepared or cooked–just tossed on a platter! 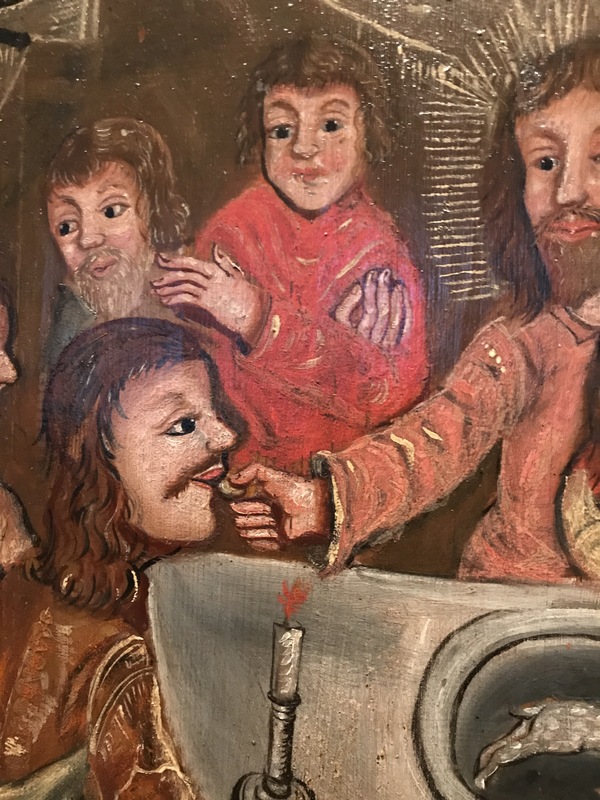 Charming painting though—love your detail shots. Right, I think the lamb is meant to be enjoying the occasion too! Fulfilling his mission of being eaten! This is lovely post. It made me very happy. Thank You. Have a nice day! Thank you! My grandmother came from Finland, and I was very happy to finally visit her very interesting country! Oh my gosh. How wonderful. Did You visit the place where she lived? May I ask where, because I have visited nearly everywhere in Finland and I may have photos or a post from that place. For example, I have made a post presenting Kalvia church. 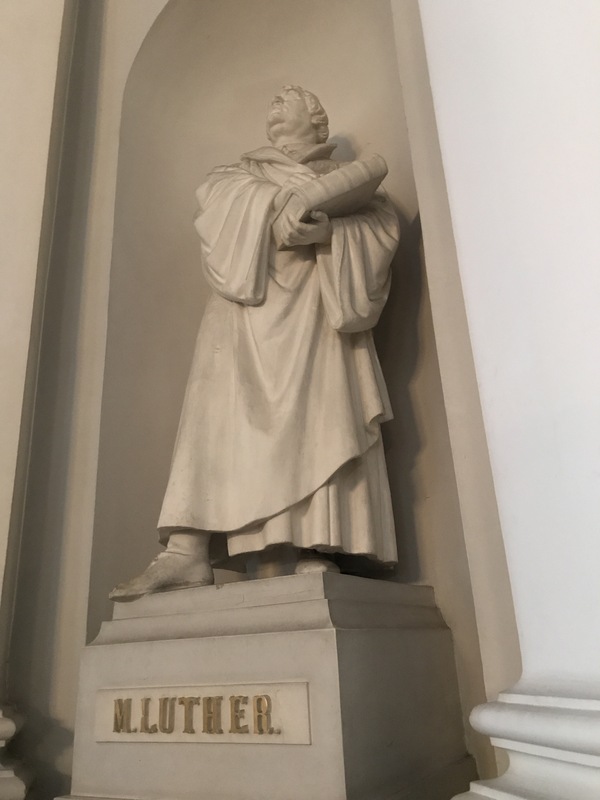 In that post, I have photos from the bell tower, unique Poor-man statue, Votive ship inside the church and “normal” inside photos. Notice that generally on countryside bell towers are separated from the churches itself. The fact is that our countryside offers most beautiful churches in Finland. Thank you! I don’t know the name of the town but I hope to find out. I hope to return to Finland sometime too.